Fiona settled into her foster home very quickly. She is an absolute love bug. She follows her foster mom everywhere and wants to always be right with her. She is very happy to lie at her feet, beside the chair or on her lap if picked up. Fiona doesn’t beg to be on laps and does not jump up on furniture, but quickly makes herself comfortable by lying on her back and falling asleep quickly when lifted up onto foster mommy’s lap. 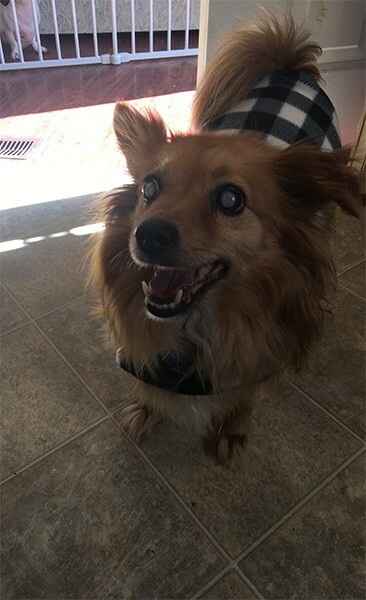 Fiona has cataracts that the vet thinks was caused by her diabetes. She must be able to see shadows because she can see when there is something above her, like a human or a bigger dog. Her blindness does not restrict her as far as following foster mom around the house and coming when she is called. Fiona sleeps in her doggie bed at night. During the day when her foster mom is at work, she is gated in the kitchen away from her foster doggie brothers and sisters. She loves her foster kitty brother and sisters though. She plays and sleeps with them very well. Fiona went to the door for the first time today, 8-4-15, to be taken out. She peed and pooed! She does go every time she is taken out. On a rare occasion she will pee in the house on a pee pad but only if left for long periods of time. This is awesome for a dog that is diabetic. Fiona takes 5 units of insulin 2 times per day. Her diabetes has been under control now for about 6 months. She is extremely cooperative with the insulin injections especially if she is has a treat to chew on as she is getting her shot. Fiona is an absolute sweet heart and is going to make someone a wonderful little companion someday. Her foster mom thinks that she would do best in a quiet home as the only dog with a kitty brother or sister. She would also do well in an all-adult household especially if there was someone home with her to keep her company during the day. She also LOVES to go for car rides and does well with other doggies outside of her territory. Fiona was adopted on December 31, 2017. Fiona is great with smaller dogs but gets anxious around larger dogs. Fiona is looking for her forever home. If you think it could be yours, read more about Adopting from BDRA before submitting your application below. BDRA relies on your donations to rescue blind dogs around the United States. Please consider giving in support of Fiona. 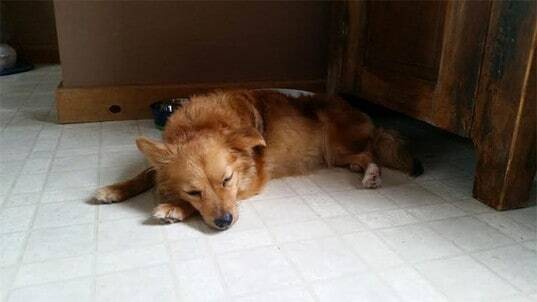 Foxie Fiona continues to do well in her foster home. Her spunky personality shines through more and more each day. She is a bit of a deva but loves her people!! She rolls over for belly rubs, gives kisses and sits up for her dinner. Fiona loves car rides and is an excellent travel companion. Fiona will need to be the only doggie in the home but wouldn’t mind a dog friendly kitty buddy to play with!